Grandfather Neu came to Canada from Austria around 1900, fresh out of the Austro-Hungarian Army, and with a background in brewing rather than farming. He married and settled in Star City, where the next two generations were also based until 1963. He was only a so-so farmer, and to help make ends meet he became the butcher for his vicinity. On Keith’s mother’s side, his grandparents came from the U.K. and had been a dairymaid and a coachman. Keith was born in Star City in 1958; the household moved to Hudson Bay when he was five. His father, Arnold, farmed and went logging, but did not raise livestock. Keith counts his farming career from age 14 when he was first paid to drive tractor all summer long. As the sole son, in the midst of four sisters, he was the obvious one to take over the family farm, though in his entire crowd of male cousins he was the only one who stayed on the land. 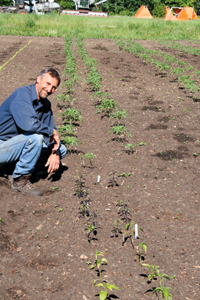 At first he was a ‘conventional’ bachelor farmer, starting in the early 1980s. Like so many young farmers at that time, he was forced into bankruptcy before the decade ended. His father, still farming as well, scraped through and decided to ‘go organic’ rather than continue to pour money into pesticides and fertilizers when it wasn’t coming back in yields or sales. Keith left to work in the Alberta oil patch for three years, then returned with a wife and a nest egg and so was in a position to take over the homestead when his father retired. Although Keith met Monica in Edmonton, she came from a cattle ranch near Preeceville, just 95 km away, and had qualifications as a partner in farm operations that few city girls could match. “I just had to find a different way to make a steady income and stay on the farm.” In the spring of 2006, Keith attended a meeting in Prince Albert organized by Food Secure Sask. Everyone was really concerned about the quality of food available, the chemicals being used, and who controlled their food supply. “The idea started to take root — to have real food security you have to have a farm or know a farmer. And I realized that my farm doesn’t produce food — it just feeds the system. In the ‘dirty thirties’ my dad had no money, but always had a full belly because they produced their own food. I had to figure out how to feed people directly — the full meal deal — the old pioneer-type of self-sufficiency.” Keith knew a bit about Community Shared Agriculture, and since he’d already been selling his beef directly to consumers since 2000, he started talking to some city friends who were very enthusiastic about the idea. In the spring of 2007, he started his Community Shared Agriculture Project with 30 members signed up. The next year 52 people became members and by it’s fifth season, over 120 people are ECO Farm members. Long-range plans are to reach the farm’s capacity of 200 members. The basic plan is simple: Etomami Community Organic (ECO) Farm members sign a contract each spring and include 12 post-dated cheques. Keith then supplies the preordered food twice a month during growing season, and once a month during winter and spring. Products include garden produce (fresh, frozen, canned, dried, pickled), beef, chicken, eggs, flour, flax and other available food throughout the year. Plans for the future include building a bigger cold/frozen storage area and a winter greenhouse, planting an orchard, getting honeybees, and buying grain cleaning and milling equipment to supply flours, rolled oats and pearled grains. Keith also plans to build a commercial kitchen, an abattoir, a biodiesel plant and a biomethane digester to supply electricity and become self-sustaining. If all goes according to plan, the farm will employ five to six full-time, and many part-time people. Community Shared Agriculture has many advantages. Consumers know who produces their food and how it’s produced. They support local, sustainable agriculture and ensure that farmers receive a fair price. They support the environment, get fresh, healthy, tasty food, and have a farm they can go to. Farmers are provided with the stability and security they need by having a steady income and they get a community that cares about the farm and the farmer. Keith’s plans for the future also include mentoring and assisting families that want to get involved in Community Shared Agriculture. ECO Farm hopes to be a pilot project that inspires farmers to start similar projects so many consumers will have access to Community Shared Agriculture and many farmers will be able to stay on their land, make a living, and do what they love doing. For more information, contact Keith.